I’ve previously reviewed Big Fish Audio/Funk-Soul Production’s Vintage Strings and Vintage Rhythm Section in these pages, and in both cases, I was impressed with both the collection of sounds and their authentic ’60s and ’70s soul/funk/pop (that is, non-orchestral!) vibe. My one regret was that I never quite got around to auditioning the original BFA ‘vintage’ title, Vintage Horns. Thankfully, I can now put that right as the development team have released the Vintage Horns Bundle, combining the original Vintage Horns title and the more recent Vintage Horns 2. Both volumes in the bundle provide a selection of multi-sampled, multi-articulation, virtual instruments that are playable in exactly the same way as a conventional orchestral sample library is. However, what we get here are brass instrument sounds and articulations that are much more suited to soul, funk and pop. As for the other ‘vintage’ libraries in the series, the sounds are very deliberately ‘retro’ and, while that means the sounds are not always pristine, in use, that vintage vibe most certainly comes through. The instruments within the two volumes cover similar general ground. Those in the original release are perhaps more ‘bread and butter’ with Baritone, Tenor and Alto Saxes, Alto and Soprano Flutes, Trombone, Flugel Horn and both Muted and Open Trumpets. These very ably cover the bulk of the ground needed to create any sort of contemporary brass section. In contrast, the intention with VH2 was to aim at instruments with more specific characters. There are 14 different options in total and their titles include ‘60s Cool Jazz Trumpet’, ‘Retro 70s Lead Trumpet’ and ‘Classic Film Noir Alto Sax’, for example. Some of these instruments, as well as adding character to a section, can also do a respectable job for solo performances. Instruments from both volumes feature a range of keyswitchable articulations including sustained notes, short notes, stabs, fall-offs, swells, sforzando and shakes. Both volumes ship with individual Kontakt instrument presets but Vol 1 also has range of very useful multis. Titles such as ‘Memphis Soul’, ‘Detroit Soul’ or ‘Big Band Section’ give you a clear indication as to what each is designed to deliver. The Kontakt front-end also offers EQ, tape saturation and a very nice reverb for further shaping of your sound. And that sound is very good indeed. OK, so you most certainly have to know a thing or two about arranging for this type of brass section to create a convincing performance but, if your brass chops are up to it (or you are prepared to learn), then the Vintage Horn Bundle offers an excellent array of sonic possibilities. 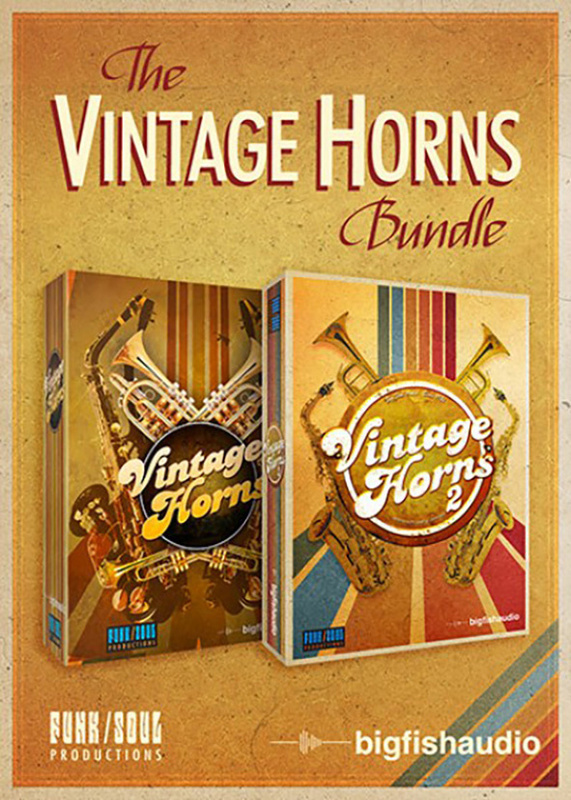 The downside is that, like high-quality sample-based orchestral instrument collections, even with the advantage of the bundle pricing, the Vintage Horns Bundle is not a casual purchase. That said, it packs an impressive sonic punch and is most certainly worth auditioning alongside the likes of NI’s Session Horns Pro or Chris Hein’s Horns.